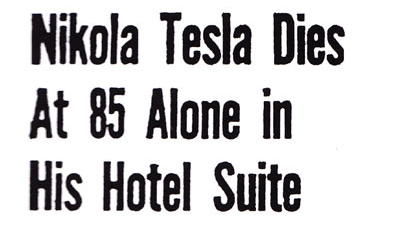 On January 7th, 1943, the Orthodox Christmas Day, Nikola Tesla was dead. FBI mastermind J. Edgar Hoover sent his men over to the New Yorker Hotel. They opened Tesla’s safe, and they took what they wanted. Tesla and his few friends and co-workers had been monitored for some time, as Tesla had always said that he was able to produce a super weapon. A weapon to end all wars. In fact, the U.S. government was already working on such a weapon, the A-bomb. Tesla had no super weapon, but super ideas. Concepts. Visions. A mind for the future. Maybe his persona will find a place at Wardenclyffe soon, in the museum. And maybe Elon Musk (and other financially potent Tesla fans) will help build that place with a price-tag of 8 Mio $. Anyway, Tesla will always be remembered as someone who wanted his ideas and inventions benefit mankind. Thank you, Nikola, even if they don’t know your name, or age.